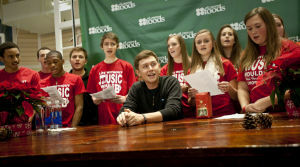 American Idol's Scotty McCreery sings Christmas carols with West Forsyth students at Lowe's Foods in Clemmons Saturday, December 14, 2013. Love this article. Scotty is so inspirational and so down to earth and l know he will always stay so humble. HE IS SUCH THE REAL DEAL, he should be at the top of every list in country music WHAT A ROLE MODEL!!!!!!!!!!!!!!!!!!!!!!!!!!!!!!!!!!!!! WHAT A BEAUTIFUL PERSON !!!!!!!! Thanks donna , don't know how you do it with all the holiday stuff and keeping us up with Scotty news. Wish l could send you a gift !!!!!!!!!!!!!! You are a BLESSING!!!!!!!!!! THANK YOU ! THANK YOU ! I did too Love this article. Yes he is so real that you can't help but admire and love him & so down to earth and surely will always stay humble. he's such a Beautiful person. He's a GREAT ROLE MODEL TO YOUNG TEENAGERS!!!!!!!! and then we will see those young teenagers on Idol. Happy Holidays to Scotty and his family. and to our staff at fans of Scotty site. and goes to you Donna. sure do love ya'll.